The fans will have fun if the Hurricanes start winning, whether it’s 2-1 or 8-0. They want to see their team playing in the postseason. That would increase the fun quotient exponentially. 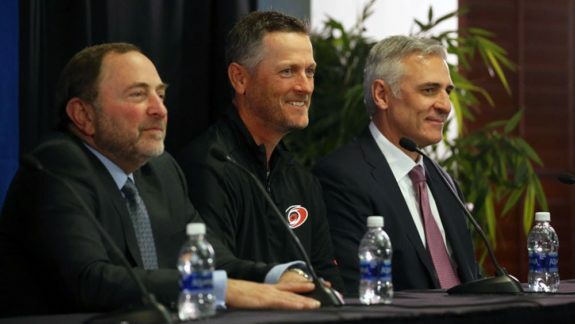 An objective look at the Dundon tenure that started in early 2018 reveals that not a lot has changed. He made a big splash when he bought the Hurricanes, pledging to enhance the fan experience. For a little while, he lowered the price of parking and at PNC Arena. Concessions prices also were lowered. But, those were initial short-lived moves designed to capture the attention of fans who may have stopped coming to the Hurricanes games. Attendance seems to be up over last season, but a look at the numbers says “not really.” The average home attendance in 2017-18 was 13,320, versus an average of 13,495 so far this season. This is odd because the from the vantage of media row, the building has looked fuller this season than it has in a long time. Also, the announcement of low attendance figures hasn’t seemed to have been as often an occurrence this season. Nevertheless, the numbers are what they are, and in part have not changed because there hasn’t really been anything tangible done to enhance the fan experience this season. Even promotions wherein the fans are given team hats have gone by the wayside. The opening night of the regular season, the team gave away towels that were placed on sold seats, not given to fans as they walked into the arena, as was always the case under previous owner Peter Karmanos. Ultimately the Authority said that the new scoreboard could not be installed in time for this season due to a lack of time to ensure that it be safely installed. One of Dundon’s ideas that he was able to pull off was convincing his team to dress in Hartford Whalers uniforms and play a game against the Boston Bruins. Most everyone reports that it was a rousing success. The Hurricanes won, the uniforms looked fantastic and of course, will provide another option for fans to consider when wanting to purchase team gear. The mood in the arena was vibrant and exciting. Missing from the “remembering our heritage” theme on Whalers night was former radio play-by-play voice of the Hurricanes and Whalers from the very beginning, Chuck Kaiton. Dundon had made moves to change the radio delivery in the offseason and apparently Kaiton was overlooked as a part of the Whalers heritage worth celebrating on Whalers night. The Hurricanes will take their green game on the road in a return engagement with the Bruins on March 5. No matter if hat giveaways are gone or green uniforms are being worn or eventually a gargantuan scoreboard is in place, what matters is winning. Dundon says he wants to win. One would think that would lead to bringing a proven scorer to the team. So far, the only thing the Hurricanes have done regarding a proven scorer is trade one – Jeff Skinner – to the Buffalo Sabres. Winning is the catalyst for fun in professional sports. Winning leads to celebrations and to more fans filling the arena. The Hurricanes have had trouble scoring. Dundon finding a player who can consistently score and help lead this team to a spot in the playoffs would really be fun, not just for the fans, but for him, too.